Rocket Cottage in South West England is a perfect choice for a great holiday or a fun short break in Cornwall. Find out more about Rocket Cottage below. A cosy traditional double-fronted stone built cottage near the centre of St Agnes within easy walking distance of local shops, pubs and restaurants, and only half a mile from the sandy surfing beach at Trevaunance Cove. The cottage has great character and interesting origins taking its name from the now empty Rocket House next door, from which the maroons were fired to summon the life boat men to give assistance for those in distress along the coast. Entered directly from the road into a tiny central hallway, there is a sitting room on one side with a glazed door leading to a small enclosed courtyard garden at the rear and on the other side a dining room, both rooms have low windows and are comfortably furnished. Beyond the dining room is a small fitted kitchen and at the other end a lobby and a bathroom W.C. with hand basin and shower over the bath. Cottage stairs lead up from the dining room to a landing and three pleasant bedrooms, two at the front, a double and one with twin beds, the third bedroom at the rear with a kingsize double and an en-suite shower room W.C. with hand basin. The pretty south facing courtyard garden has a patio area set in green slate chippings and access to a gated side lane. There are no parking restrictions on the road outside. Rocket Cottage is family friendly self catering. We have the following details listed regarding Rocket Cottage accommodation accessibility but we would recommend that you always confirm these prior to booking with the owner or operator. Rocket Cottage is a great base to explore the wonders of Cornwall and you will find plenty of activities near by. Rocket Cottage is at St Agnes, Cornwall. Check out the map below for directions, use the controls to zoom in. "Lovely comfy cottage, right in centre of village walking distance to everything. Have stayed four times..."
"Well furnished. One of the best properties I have stayed in." "The cottage was lovely, and St Agnes is such a nice town with good bus services to Truro and Newquay..."
If you have stayed at Rocket Cottage why not add your thoughts, comments, pictures to our Facebook page? Don't forget to add the name/town/page link to your comment so its attributed to the correct place. Please keep it polite, we are sensitive souls! Find Cottage Holidays works closely with independent cottage owners and leading holiday travel operators to provide you the widest choice of self catering accommodation across England. 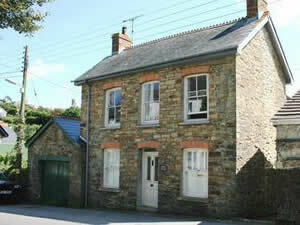 Rocket Cottage in Cornwall is available through: Cornish Cottages.